At the Thirty-third Biennial Convention of the General Synod of the Evangelical Lutheran Church in the United States, held in Kountze Memorial Church, 16th and Harney Streets, Omaha, June 1-13, 1887, the Shull heirs gave to the Board of Church Extension, two lots in the new Shull’s 2nd Addition to the City of Omaha. These lots were in memory of their father and mother, Jacob S. and Susanna, for the expressed purpose of establishing a Lutheran Church in the southwestern part of Omaha. In 1888, the Board of Home Missions of the General Synod commissioned Rev. Luther M. Kuhns to found and establish this new work. He arrived in Omaha, August 23, 1888. He was told the Parish boundaries were set at “20th Street on the east, Pierce Street on the north, and the Park.” The area was very sparsely settled. Sunday, December 2, 1888, a temporary chapel was dedicated. The chapel was a frame structure with a vestibule and a room for the use of the sexton. The total cost to build and furnish was $902.75. This chapel remained in use until 1958 when it was demolished. The congregation officially organized on Sunday, April 7, 1889, as Shull Memorial Evangelical Lutheran Church with 25 charter members. In Pastor Kuhn’s words, “It was a delightful day.” The first congregational meeting was held on Wednesday, April 17, 1889, and articles of incorporation were adopted. The congregation was received into Synodical membership within the Nebraska Synod on September 15, 1889. On Wednesday, October 12, 1892, a special congregational meeting was held to change the name of Shull Memorial Evangelical Lutheran Church to Grace Evangelical Lutheran Church. Mrs. Grace Wilke Dreibus told her daughter, Helen Dreibus Disney, that her grandfather, Mr. William Wilke, had suggested the name change during the discussions around building a new brick church building. On August 5, 1896, Messrs. J.F. Smith and William Wilke, together with Rev. Kuhns visited Oakland, Iowa, to see a church recommended to them to duplicate. The trip was made by buggy going and returning the same day some 72 miles. On September 1, 1896, Bell and Kent, Architects, Council Bluffs, Iowa, were invited to furnish plans similar to that of the church in Oakland. On October 5, 1896, at a congregational meeting, the church council was empowered to enter into a contract to build the church. Ground was broken for the new church building on Wednesday, October 7, 1896. On Sunday, October 25, 1896, the cornerstone of the new Grace Church was laid. On Sunday, August 5, 1897, the church was formally dedicated. The total cost for the new building, its furnishings, and moving the old chapel to the south was $5,759.87. There were additions to the building in 1901 consisting of a Pastor’s Study and in 1912 consisting of doubling the Sunday School room and excavating under the church to permit the addition of a kitchen and other accommodations. Two fires damaged the building. The first occurred in 1912 and the second in January of 1927. The second destroyed the interior of the church. It was restored and rededicated on Sunday, December 11, 1927. The nave of the church was enlarged and remodeled in 1949. Much of the labor and materials for this extensive project was donated by members of the church. The look of the nave remains similar today. The increased membership of the church and also the Sunday School caused the congregation to think about either further expansion on the present site or relocation to a different site. 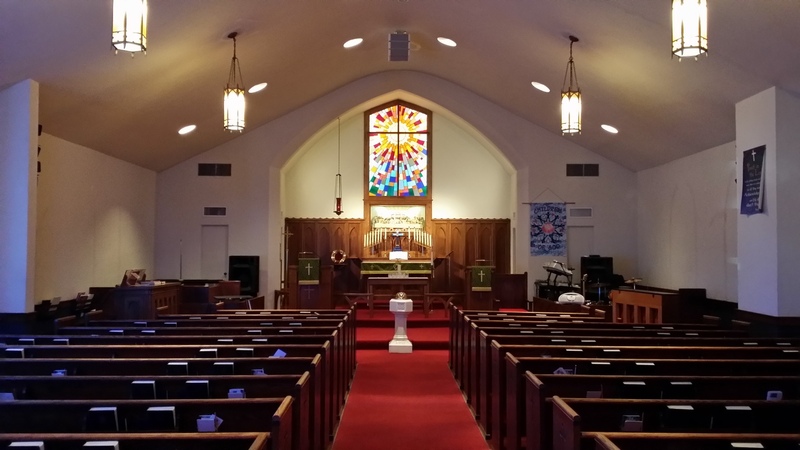 The decision was made when the congregation approved plans for theconstruction of an education/administration unit as an addition to the north of the existing church. The unit was completed at a cost of about $80,000 and the unit was dedicated on August 25, 1957. An all-weather parking lot was installed in June of 1962. In 1967, the congregation replaced all the stained glass windows. They remain to this day. In 1978, the northeast entry was redesigned to provide ground level entry into the church. In 1987, the church was completely air-conditioned, thanks to a gift of Mr. Leonard Peterson. In 1990, a memorial window commemorating the Centennial of the congregation was placed in the sanctuary along with new lighting to brighten the sanctuary. These were gifts of Mrs. Helen Dreibus Disney in memory of her grandparents, William and Lucinda Wilke. A new Temple Organ was installed in December of 1999. This new organ was a combination of the parts from the Moeller Organ of 1928 and new technology. There was an additional antiphonal unit placed in the balcony along with additional pipes installed in the organ chamber. The new organ also incorporates digital technology. A new parking lot was installed in the fall of 2011. Additional parking spaces and a redesign creates a better opportunity for access. A new stone coated steel roof was added to the building in 2012. This special roofing replaced the asbestos tile roof that had served its purpose for many many years. The congregation continues to be vital part of the Columbus Park Neighborhood. It continues to reevaluate its mission to provide Christian outreach and a Lutheran presence in its community. God has a purpose for its presence here.